Ellsworth Farm has a wonderful 'pick your own' operation in Sharon - they have strawberries in early summer, blueberries and raspberries now, and all kinds of apples throughout the fall. 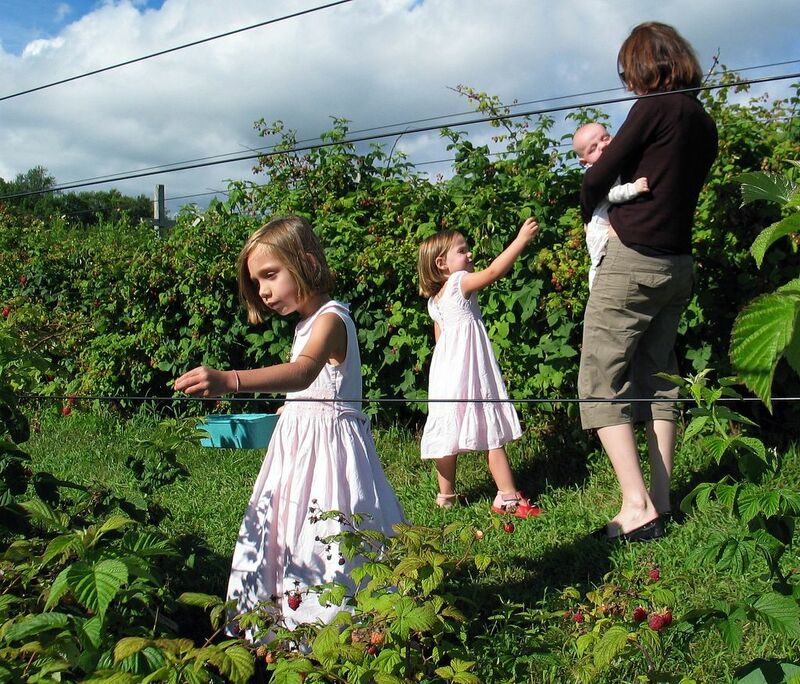 I went to pick some raspberries today, and the only other people there at 4:30 on a summer afternoon was this family. Remarkably, they were French - the mom kept saying things to the kids like "ne pas mange!" and "C'est superbe!" A few other pictures of my berry pleasant afternoon here. including a special one for Passante. What a sweet photo. I hope your berries were as nice as this scene. such a fun day out! I LOVE blueberries, and we can't get them here in France! thanx you visited my Polish Katowice photoblog :) I've put a link to google.maps to show where my city is located, you can have a look. it is to the north east of Warsaw. That's nice. In Sweden we eat a lot of lingonberries. Ever heard of it? Lovely image and (oh dear, I am about to sound like my late mother) how delightful to see little girls in dresses! Why do you think those nice little French girls were not allowed to eat their picking ? Did the mother plan to cook a nice pastry with the berries ?